Are you always tense? Are you constantly battling sore and weak muscles? If your current treatment isn’t doing the job and your health continues to suffer, then magnesium could be the answer to your woes. Magnesium is a critical mineral that is essential to over 300 functions in our. It has beneficial effects for muscles and can be used to relieve overall tension and soreness. 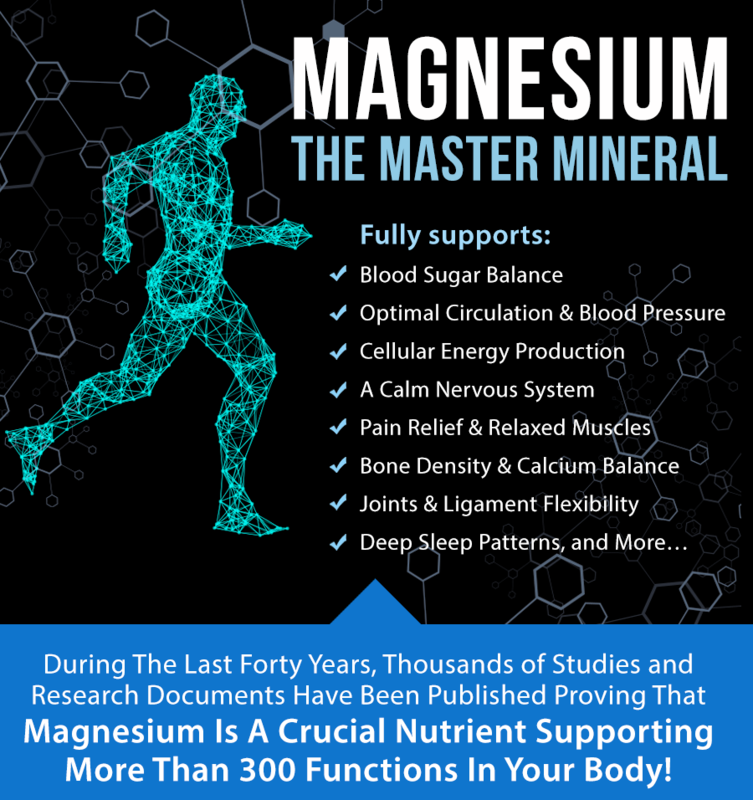 Magnesium is needed for energy production, the development of bone, muscle and nerve function, and for DNA and RNA production, among other things. Magnesium is found in a wide variety of plant and animal foods. Some of the best sources of dietary magnesium include: nuts, seeds, beans, green leafy vegetables like broccoli and spinach, whole grains, and red and white meats. While magnesium may be abundant in these foods, the body absorbs only around 30-40% of it. Many of the foods we eat now, even those that should have magnesium, lack magnesium. Processed foods often have no or low amounts of magnesium and many of the crops being produced have lower amounts of magnesium than expected. Commercial farming can lead to soil with low magnesium if the crops are not rotated and essential nutrients are not added in. Plants depend on the nutrients in the soil to grow and if they are not present ,the crops will have lower amounts of those nutrients. The recommended dietary allowance (RDA) of magnesium for adult males is 400mg and 310mg for non-pregnant adult females. Scientific studies suggest adequate doses ranging from 500mg-1500mg; therefore, current recommendations may not be enough. Numerous dietary surveys have found that magnesium intake for the average adult, based on the RDA, is not adequate without supplementation, leaving many people with magnesium deficiency. Magnesium deficiency is typically determined by blood; however, this is not a good indicator of the body’s total magnesium amount. The adult human body contains around 25 grams of magnesium with the large majority being found in the bones and soft tissues, while less than 1% is found in the blood. So while the blood levels may appear to be fine, the entire body could still be deficient. Long-term low intake or excessive losses of magnesium due to health conditions, or medications that affect magnesium levels, can lead to a deficiency. Some signs and symptoms of magnesium deficiency include: loss of appetite, fatigue, weakness, numbness, tingling, muscle cramping, seizures, and abnormal heart rhythm. Because magnesium and calcium have a close relationship in the body, a severe magnesium deficiency can also cause low levels of calcium. There are some medications, health conditions, and lifestyle choices that can put you at risk for having inadequate magnesium. Diuretics, often known as water pills, are medications that can increase the excretion of magnesium from our bodies potentially causing low magnesium. Other medications that deplete magnesium levels are bisphosphonates such as Boniva® and Fosamax®, antibiotics such as tetracyclines and quinolones, proton pump inhibitors such as Nexium® and Prilosec®, oral contraceptives, and estrogen replacement. Individuals who have gastrointestinal diseases such as Crohn’s disease and intestinal resection, as well as other health conditions, such as Type II diabetes, can have magnesium deficiency because of lower absorption and increased excretion. Chronic alcoholism can lead to a number of vitamin and mineral deficiencies including magnesium since it lowers absorption and increases excretion. As we age, the our magnesium needs also increase. It is possible to have too much magnesium. Important signs and symptoms of magnesium toxicity can include: diarrhea, nausea, and vomiting. When beginning to take a magnesium supplement it is suggested to slowly increase the dose every couple of days in order to optimize it. When the body can no longer absorb the magnesium, diarrhea will start to occur and this marker can be used to identify the maximum tolerable dose for each person. Magnesium toxicity is more likely to occur with large doses of magnesium laxatives and in individuals with kidney failure. Magnesium, both as a supplement and a treatment, can be extremely beneficial to our health. Some of the benefits include its use as a muscle relaxant, overall calming effect, bone health, and its use in preventing migraine headaches. There are many commonly used forms of magnesium. The various forms have different indications based on the differences in their overall absorption and, in some cases, where they can go in the body. Magnesium glycinate, which is highly absorbed and widely distributed throughout the body, is often used for overall magnesium replacement. Magnesium sulfate is often compounded into creams and used as a muscle relaxant, for wound care, and as a skin-soothing agent; it is also the active ingredient in Epsom salt. Magnesium threonate is a newer form that is effective at getting into the brain where it can have beneficial calming effects, beneficial headache effects, and aid in healthy nervous system function. Magnesium citrate and magnesium oxide are typically used as treatments for constipation; magnesium citrate acts as a laxative while magnesium oxide has stool-softening properties because they are both poorly absorbed. Magnesium carbonate works well as an antacid for heartburn and indigestion. Magnesium chloride is used in many different preparations; with its oral form being used for overall magnesium supplementation as well as improved digestion and its topical form for muscle relaxing and overall skin and wound health. Magnesium is vital to energy production and many of our bodily functions, however people of all ages are not getting enough from diet alone. Magnesium supplementation is recommended because it can lead to better heart health, physical health, and mental health. Next time you start to feel your muscles tense up and become sore and weak you should ask yourself if you are getting enough magnesium; instead of those pain pills, magnesium may be just what you need for relief. Challenge yourself to take a magnesium supplement and you will discover its full body benefits. For those interested in doing some self-investigation of magnesium we recommend a book titled “The Magnesium Factor” by Mildred Seelig, MD, NPH. If you have questions about magnesium or other supplements, or want to start supplementing magnesium and don’t know which type is right for you, feel free to call or stop by Annie’s Apothecary where our friendly staff will assist you however we can.